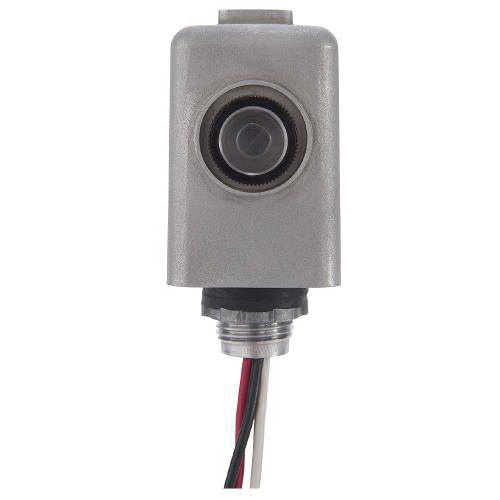 Intermatic Thermal photocontrol in gray color, features heavy-duty die-cast zinc construction. It features sonic welded polycarbonate housing and lens to seal out moisture. Thermal photocontrol requires 120-Volt AC voltage for operation. It is suitable for exterior lighting, street lighting, parking lot, pedestrian pathway and landscape lighting. It has a dimension of 1-15/16-Inch x 3-3/4-Inch x 1-15/16-Inch. Thermal photocontrol has 6-Inch wire lead terminal connection. It is stem mountable. Thermal photocontrol with bi-metal switch, operates at temperature of -40 to 158 deg F. Thermal photocontrol is cUL listed and CSA certified.